This question look like stupid for you but we will need to know correctly what is it, small history of BG. How it’s built. You can see in History of Art that background was used and get an evolution. Each Culture have his style and rules. We can find in Theater some similarities with video games. We have a space limit where actors need to move. 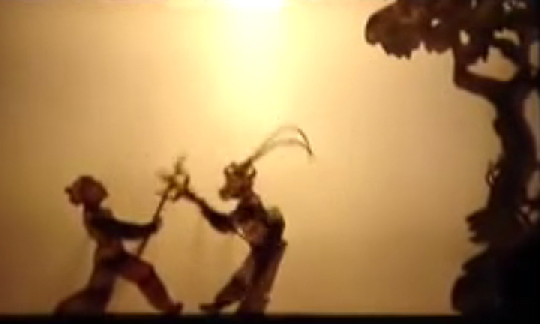 Here you can see a picture from a Chinese Shadows puppets theater. It’s show simply that the characters are outside. Only with one background element and light, people can believe it’s a tree and sun. 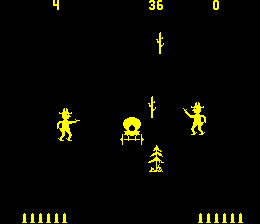 You can find some similarities with some early video games: like Gunfight on arcade (1975). Simple element like trees or Stagecoach can make you feel you are outside in some desert and at what time the scene happened. The Backround is the most important part for graphics, even if people don’t take it as important as it is. Your work on background is closer to scenography: How to make simply an ambient to let people believe what you want to express. For this you will need to create and place elements. Like a tale, your game will have a story and a world. The background is here to built this. The ambient and emotion are also some settings important. But you can even tell a story only with your background.We can have a look on New Ghostbuster 2 made by HAL lab. There are paintings on the walls, a Bust of a woman, some rope lines, a red table. You can easy understand even without seeing the movie that place is some kind of Museum. Something here go wrong. Walls are dirty and bloody, it’s a little bit messy. This place is not peacefull and you need to be careful. Something bad happened before and maybe the danger is still here. This is a perfect example how to tale a small story only with background. You don’t need to explain with text, the player will feel that this is a museum and it’s a dangerous area. First you need to choose a direction. 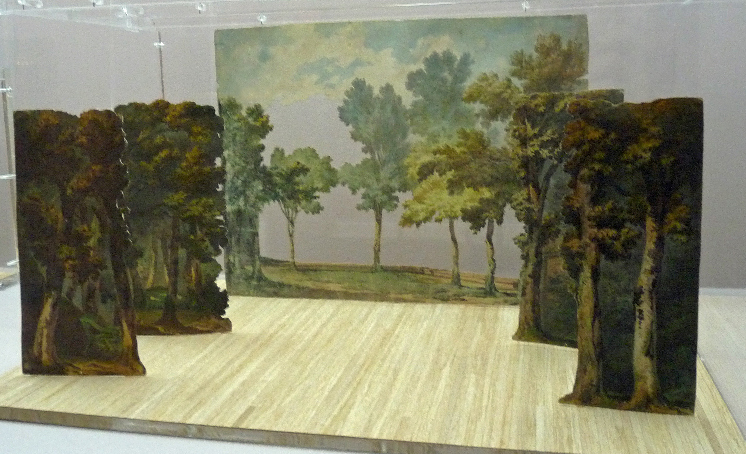 If you want to make a platformer game, a puzzle-game, a top-down game or a shooter, it will be always a different structure but the main rule is to keep the same perspective for everything, like a trompe-l’oeil. We will need to choose a correct angle for everything, characters, bg element and shadows. First, you will need to choose your type of game to know the perspective you will need to built. For my opinion, Plateformer and Shooter are easier. After we will define, the universe (Nature, urban, fanatsy,…). It will be nicer if player can have access to diferent type of Level ambient. 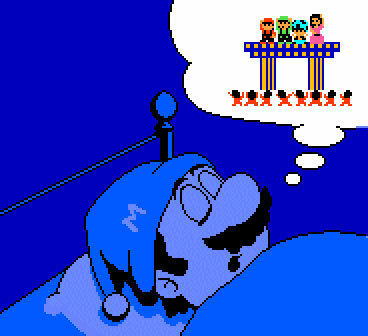 You can make him feel that he make progress and he can associate different difficulties between ambient like in Mario. First level of Mario is nice, blue sky, bushes (not difficult). Totally different as dungeon’s levels, with lava, fire, dark background. 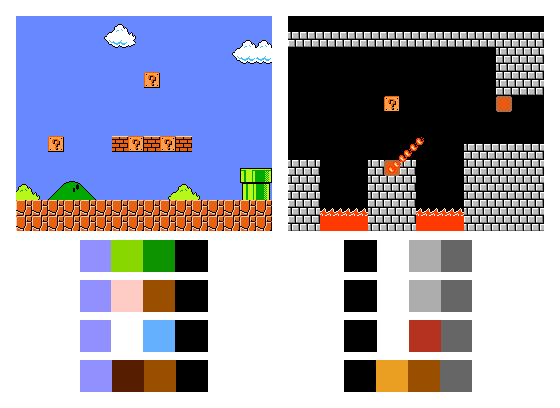 You can see that palette of world 1-1 is colorfull, friendly. The BG element are different and decorative. In other side, world 1-4 is darker and scary. The palette is using more grey and a bit red. The BG element are minimalist, the grey bricks are clean and lava have a form like a spike/flame. The color red catch player eyes and already give you info that dangerous. You need to have empathie if you want to create good level-design and Background. You work for making players feelings, that he can create association of joy or panic with different type of level. The Background can give information of the level difficulties. So even if it’s difficult, player will want to manage it because he will have the satisfaction of going closer to the final stage. If you create a background dark with walls, skulls and a hard level-design, the players will associate all together. The BG element can give him an information. All what he see on screen will interact with his own culture references and will prepare him to manage this. His mind will be not the same when he will see a flower or a skull. Then when you will use again the skulls element somewhere, the player will know that he start to go in some dangerous area. it’s the same as Pavlovian conditioning. We saw before the Super Mario Bros Dungeon Design example. The palette color and Bg elements make an impact and push the player to change his style of playing. He will be careful and take time to manage the level design. Mega-Man (Rock-man) have also some background rules. 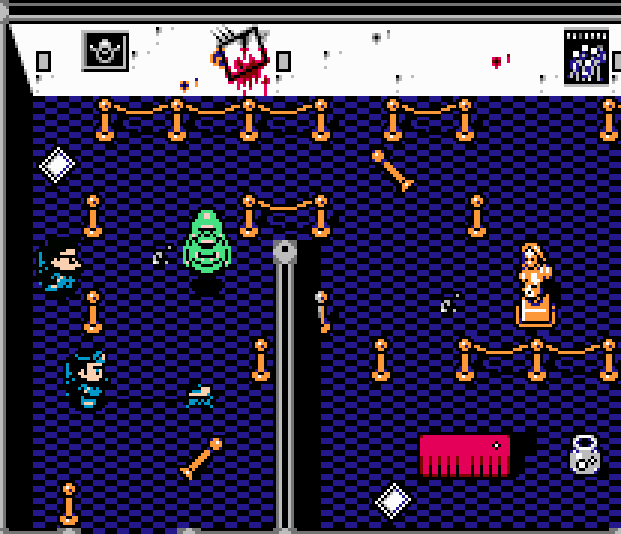 Before to fight the Boss of a level, the player will be in front of a special door. This door is always use before boss room. The player will enter in an airlock who separe the level and the Boss room. This airlock is a corridor empty with a second door to enter and fight against the Boss. 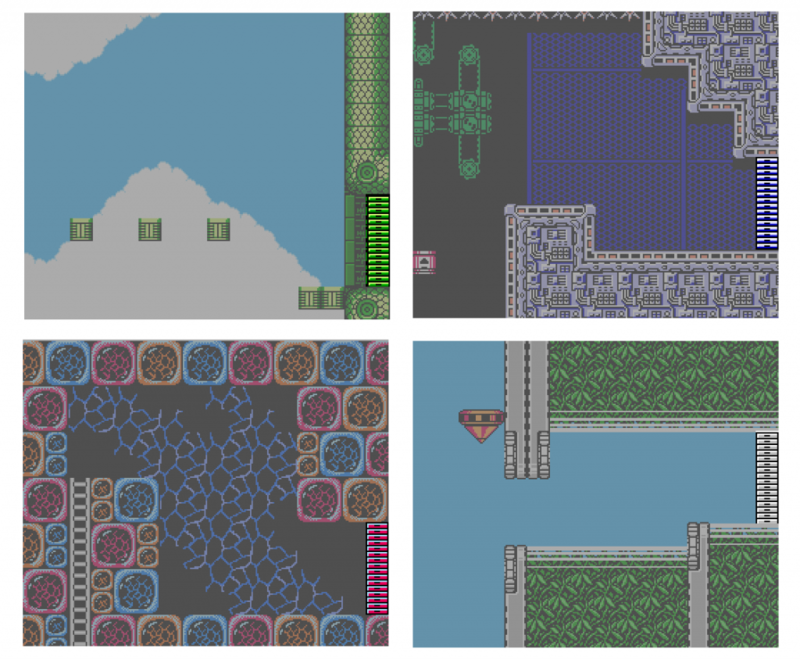 It will be always the same structure for each Megaman’s level. So when the player will arrive in front of the door, he will start to be in stress. „Do I am ready to fight? Do I have enough Energy to take a bit damage? Do I need to go back and kill ennemies to fullfil my energy ? etc.“. This door will influence the players decision and only because the door is an current element in each level with a specific use, the player can learn and trust the rules graphics we create. We need to be logical and consistent. Player spend time and energy to live in your world, he create some reference, to understand the world and to be not lost (spatial references). He discover a world, learn what are the rules of this world: What is decorative, dangerous or possible to activate , for example to open door or make free a way. A game like Kid Kameleon (on Genesis) is very interesent. The structure of the game is made to lose the player in the World logical and spatial references. Player start in a greeny calm forest. The first levels are made to learn rules of the game. Player start to make association between levels background and difficulties. 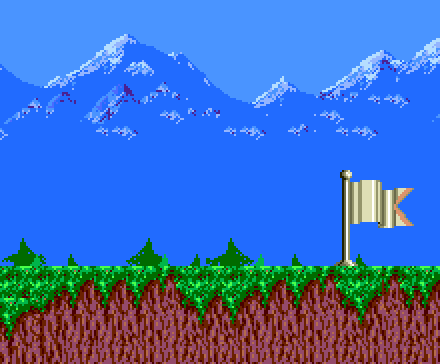 To finish a level, player need to touch a Flag. This Flag is his main goal. The level are build as a video game standard. Player start on left side and Flag is on the right side of the level. The problem is you will go in another level, but you can’t know if you go in a next level or back at the beginning of the same level or worst, to go in a previous level.The name of levels or background are not made to give you information to know your place in the game’s progression. Some levels are made with greeny forest background or sunny beach background and they are very hard. Some others are with lava or ice background and they are simple. The level have some background identities but the level design difficulties are different. Sometime you start a level after a hard one with ice, the new level is looking nice greeny or with a warm palette. Player will start to be not carefull and will die many time because difficulty is harder. This game is hell. Even if you think logical and don’t want to take warp to have less trouble, the level design and difficulties will push you to make another decisions. And also, there is a lot of level in the game, so this will push you to go faster and take a warp. If you have problem to touch the flag and die many times, you will be frustrated, tired and take a warp. This game is a very good/bad example of what’s a background and level design can do on player! At the beginning, player learn some rules, and at the end player redefine the rules for himself. Flag is my goal and warp is a dangerous decision. 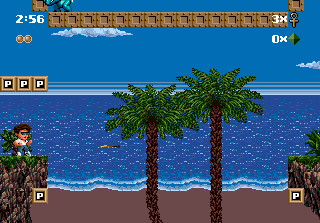 The other background element are made to influence the player’s mood. Better as to write again , here’s some visual to explain faster. Decorative is some Bg element that behind Sprites. It will be good to define what we want to include in our game. This will be the main structure of the game. Dimension, Gravity, Physics proprieties rules of the Game’s world. At the end, we could answer a little bit to the question „What’s a background?“. Background is not only graphics stuff to make pretty. Background is the structure of our world, presenting our story, in connection with feelings and teaching player’s gameplay.